Lordy but we are an incredible and deeply damaged race. Last Saturday morning we were all hungover after St. Patrick's Day and the Cheltenham races in England. We were aware that we were all broke, our banks were broke, we would go bust and belly-up were it not for the EU keeping a few bob in our begging bowl. We were morose. The world was exploding with the outbreak of war in Libya, unemployment and emigration were getting worse by the hour, poor Japan was being racked by a radiation threat and the earthquake aftermath, both President Obama and the Queen of England were coming in a few weeks time and we have not enough funds in the kitty to give either of them a proper Cead Mile Failte of the necessary width and depth. It was also raining. We were feeling the fangs of the recession and we all had blinding headaches. But only a few hours later the recession was banished, the headaches were gone, Ireland was all smiles and laughter and craic, the percussions of our national celebrations surely registered on the Richter Scale, the sun was shining, drinks were flowing again, all was right with our narrow little world. Because the English rugby team came to Dublin unbeaten in the Six Nations Championship, looking for the Grand Slam, and we beat them to within an inch of their sporting lives. That is why. It was only a game on the surface, a matter-less sporting contest, something on the margins of our bleak realities, but we beat England, the old enemy, and that transformed everything. Lordy but we are an incredible and deeply damaged race indeed! We performed poorly in the rugby championship up until last Saturday. Having been beaten in earlier games, we could not win the title ourselves. In previous rounds we'd played and performed like a team spiritually undermined by our current bad social and economic plight. We were underpowered and pallid and prone to errors. Our performances were another index to the state of the nation generally. But the fundamental truth is that for the majority of us the only rugby game that matters every spring is the game against England. It is far more than just a game. 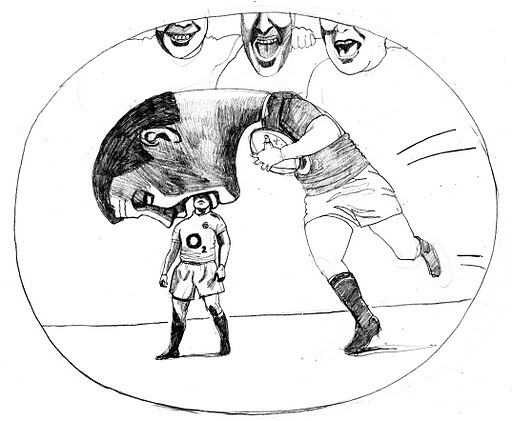 And the associated reality is that the majority of the sporting population, weaned on Gaelic football and hurling, soccer to a lesser extent, know little enough about the complex rules and regulations of rugby union. But to beat England, and especially to deny them a Grand Slam of all their rivals, that, God help us all, is pure manna for our somehow deeply damaged national spirit. And to do it just a few weeks after defeating their vaunted cricketers in that code's ongoing World Cup is, unbelievably, sufficient to keep us all in high spirits for at least the next fortnight. What kind of priorities do we live by at all? This is not a sporting piece. It comes from somewhere else. In the Aviva Stadium game we did not just defeat England by treble scores, we devoured them alive. We tore into the big men in white jerseys with roses on their breasts as if we were Brian Boru's gallow glasses against the Vikings. We pulverized them, shattered them, gutted and disconcerted them, threw them around the field like rag dolls. And the watching nation loved every second of the carnage in a way which is probably not one bit healthy or wholesome. More than any other contact code on this side of the water, rugby is man-to-man contact. It is akin to war. The hits are ferocious, the exchanges torrid, no quarter given or taken. There is a terrible beauty about the sight. Lordy we are surely deeply damaged! In some primitive sense, when we defeat the Sassenach in the annual rugby games (and we usually do over the last decade), we seem to be reaching back into the folk memory for revenge for all the injustices which our powerful neighbor definitely inflicted upon us down the centuries of history. Last Saturday every Irish player seemed to have the angry strength and power of three men. They were motivated, I'd swear, by more forces than they were consciously aware of. And that's interesting stuff too. If we, as a race, could find some way of harnessing that hungry drive and anger and power in any other area of real life and living and surviving, then for sure we would be Superpaddies, and we would not be going around Europe these days with our heads bowed and a begging bowl extended for our daily bread. Ashamed of ourselves and broke. It is such a pity that this transforming electric focus and force and power is reserved just for one spring day every year on a rugby pitch. If we could pickle it or bottle it for other uses our future as a nation would be as bright as tonight's moon over Clare. I enjoyed every second of every minute of the slaughter of England of course. But I'm a small bit ashamed of how primitive my enjoyment was. It had nothing to do with a mere game, everything to do with history. And the crowds in the stands bayed with the same bloodthirsty roar as those in the Colosseum of Rome when they threw those early Christians to the lions. Know what I mean? We are deeply damaged beyond doubt. But it was a mighty day!